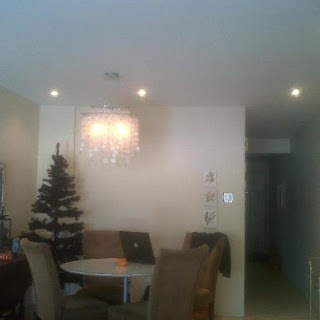 but we have working pot lights and NO MORE popcorn ceiling in our dining room! That was a brutal job - and we got really uneven results. We ended up gletting very thin drywall and screwing the boards directly to the ceiling. Of course, we had the Creative One help out - we definitely needed some brute strength so the CO and I held the sheets up and Jack screwed them in. So brutal. The pot lights were ALL Jack's doing. He had everything pre-wired before the drywall went up, but in this, um, let's call it "math-challenged" house, figuring out where to cut out the holes for the pots was definitely the worst part.